AFTER A DAY ON THE SLOPES. 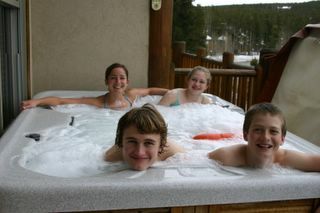 Nothing like a hot tub in the Rocky Mountain air to soothe away aches from a day of skiing and snowboarding. Here's all four Hay kids chillin' earlier in the week.